How are Excite's subs of it? I tried to get through Blade a few years back with TvNihon's, but I managed to get to episode 6 before giving up. Part of the problem was a lot of video glitches, for some reason (I think VLC was set up wrong, so it's partially on young me), but the subs weren't TVN's best. 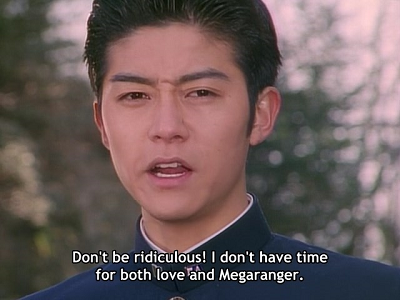 My feelings on Wizard is that it's very comparable to modern sentai. It goes full hog on the monster of the week format rather than Rider's usually more serialised nature; and as a result the plot and characters don't get a lot of development -- the only times I recall things advancing in any way before the last stretch were Beast's introduction and any new powerups. How are Excite's subs of it? Very competent. It you've seen their subs for Ex-Aid you pretty much know the deal. I officially decided they weren't messing around when a scene where Kenzaki tells Kotarou to smile, followed by Hirose saying the same thing in English, had Kenzaki saying "turn that frown upside down" to avoid the redundancy. TV-N naturally solved the problem back in the day by simply leaving the line as "egao, egao" which is... certainly one way of going about it. The biggest "problem" I've noticed is that their translation for one line changed slightly when it showed up in a flashback. There's no obvious mistranslations, and it's actually in English, so I'd say there's never been a better time to start watching Blade. Fish Sandwich, I hope by the end of it, you come back with a better impression of Leangle than I (or most people) do! I don't hate him, but his arc is the one thing in the series I've always felt iffy about. I myself remember liking the very beginning of his arc and his interactions with Garren, and also the very end, but thinking a lot in the middle dragged a bit and was hard to take seriously ("ORE WA SAIKYOU DA!" being a meme for a reason and all), but we'll see how I feel this time around. Cool, cool, you've intrigued me. Guess I'll check out episodes 1 and 2 tonight. Last edited by AkibaSilver; 04-08-2019 at 06:44 PM.. Sorry, It's just... 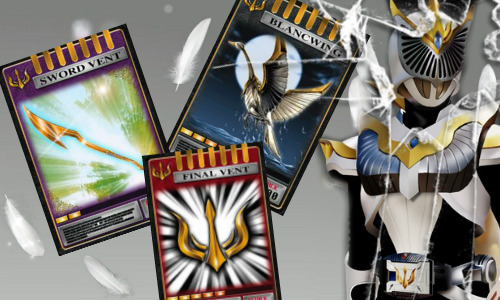 I put that picture at the top of the post there and now I'm distracted by the sheer awesomeness of Blade King Form... and also Blade in general. This show is seriously something else. Now that I've gotten to the part of the show with a spiffy new opening and a spiffy new head writer, I also remember why I partially bought the idea that early Blade isn't that great. It's because Blade just keeps getting better and better as it goes along. But I don't think it's even fair to throw the beginning of the show under the bus considering how it very specifically laid the groundwork for all the plot points and character dynamics that make the later parts of the show so engaging. One of the things I pay a lot of attention to now that I didn't back in 2011-ish when I first watched Blade was writer credits, and while Shou Aikawa immediately shows a lot of vision for the show in the few episodes he wrote before properly taking over from Shouji Imai (literally his first episode has Kenzaki talking about fighting fate for the first time), I don't quite think you can say he's solely responsible for the show's increase in quality. It's actually pretty impressive how cohesive Blade feels between all the different people who wrote for it. All the episodes reference each other directly, and even blatant "filler" style plots like episodes 29 and 30 (written by a particularly manic Toshiki Inoue) have some degree of purpose to them. You'd basically never notice when someone else is writing if nobody told you. I'd also like to take a second to give a bit of a mid-show report on my feelings towards Leangle, which I'm going to take the liberty of putting behind spoiler tags in case anyone cares. I know that's a bit much, and I'm pretty sure this is all stuff people know (and nothing too major), but on the off chance you don't know anything about Leangle, you're in the perfect position to enjoy his character and should probably go watch Blade immediately. Actually, you should do that anyway. But at any rate, Mukki, man. I love ya' and I hate ya'. You're one of the most unique extra Riders out there, with a cool and creative character concept of a hapless teenager who's essentially being worn by his own Rider belt instead of the other way around. How sweet is that? It's just so unlike anything else, and those aspects of Leangle, I genuinely find fascinating. The problem is, I don't find Mutsuki himself fascinating, and I think I've finally nailed down why that is. He serves his role in the story way TOO well. His struggles become a huge focus of the show after he makes his debut, and the simple truth is they're less about him and more about making the overall drama level of the show higher while making the existing main cast look even better than they already do. Which means poor Mr. Strongest Rider is a total no-hoper when it comes to endearing himself to the audience. 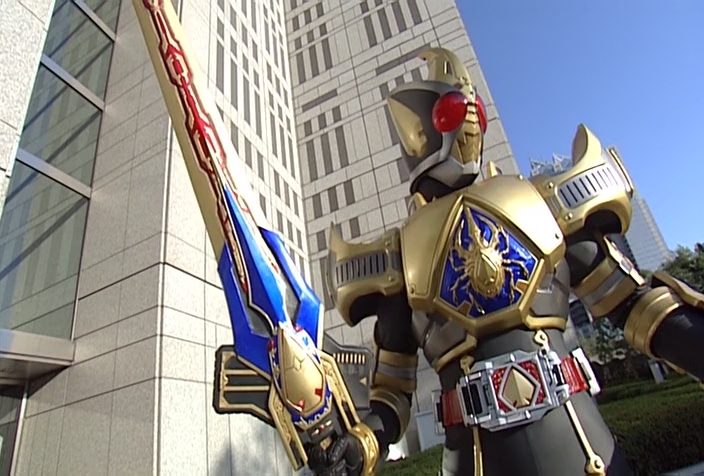 Sure, you can vaguely sympathize with his plight and all, but by design he's no real hero, and so he looks bad just for being normal, because the other Riders are all thoroughly reaping the benefits of early Blade's frantic pacing by this point. You care about Kenzaki because he's been jerked around by so many people and still manages to show unflinching faith in the goodness of people. Even when they aren't people. So when he starts showing that kind of faith in Mutsuki too, you're liable to care all the more about him instead of Mutsuki. Same deal for Tachibana. We see him in such an emotionally vurnerable position in the first dozen episodes that by the time he finally overcomes his issues to reemerge as Blade's reliable partner, we're extremely endeared to him. So when he goes out of his way to take Mutsuki under his wing, guess who we're more concerned with? Even Hajime is more likable despite being way more of a jerk because as a literal monster whose whole purpose in life is to fight, any sympathetic qualities at all from him are worth way more. It's just not a fair fight. Maybe it's because I'm now aware of that, then, that I find myself enjoying Leangle a lot more this time around. Although I'm also at the part of Blade where he gets into his wannabe gang boss phase, so my newfound patience is liable to be stretched pretty thin. Oh, and before I forget to mention it again, the sound it makes whenever the Riders throw their cards to seal Undead is like, the best thing ever. Also, in light of the last few episodes I watched, I might have to take back some of my initial praise for Excite! 's subs, but I'm not sure. There were a few lines I might have been the one misinterpreting, but one thing I do know is that they kept messing up characters talking about Chalice's cards in the plural. So consistently it almost made me think I'm the one making a mistake, but I'm absolutely positive I'm in the right here. Outside of those few specific instances, it's all been good though. It took until episode 20 for something to jump out as being wrong, and that was just the episode title card reading "Episode 2-", which, I mean, look at your keyboard. It's an easy mistake to make. Everyone should stare in awe at King Form, yes. It's debut is one of my favourite episodes in all of Kamen Rider, but actually not even because of the form itself, but rather Kenzaki taking on the King Undead and winning through sheer grit in his base form. Definitely. What's crazy though is that I remember Kenzaki's part in that episode and the ones leading up to it so fondly I forgot how many other things also happen around the same time. The show introduces the final form for its main hero while in the process of radically redefining the status quo of all the other Riders AND setting up a major new antagonist. I was watching the whole thing just kind of in awe of how much was happening. Currently watching Ryuki and I am kinda confused why they are always listening to a Japanese news report done in English with a western accent. Like it seems so random.